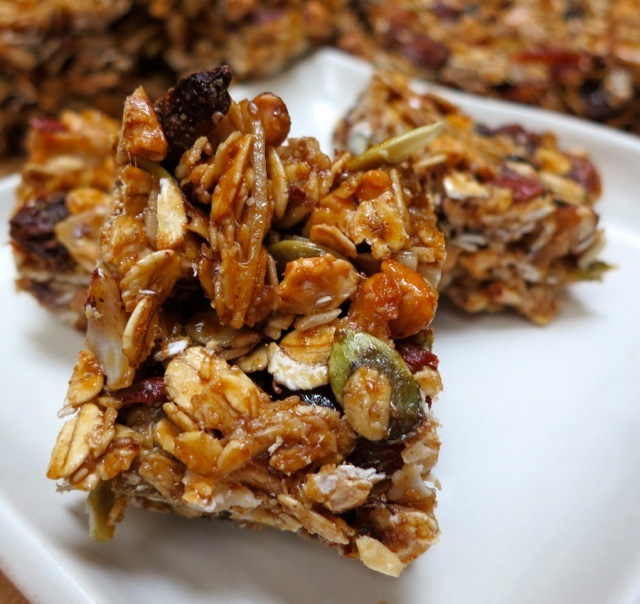 Famous Chewy Granola Bar Recipe ~ Happy Friday! A Little Happy Friday Sweet Treat! I thought I would have a little fun this Friday by sharing my favorite no bake, chewy almond butter granola bar recipe with you! They are oh so dangerously good, packed full of healthy ingredients to keep your energy level up while you’re having fun making jewelry! I love making these little sweet & healthy treats for a great snack around the house and they are always kid, friends and family friendly. Everyone Loooooves them & can’t seem to get enough…myself included! I have tweaked this recipe from a few different ones I’ve tried over the years. The great thing about these is that you can add or remove anything your heart desires. Line a 13 x 9 inch pan with parchment paper. Set the stove to low heat. In a medium pot (about a 6 quart pot) mix all of the ingredients together. Once everything is mixed well, pour into your lined pan spread out evenly pressing everything together and and to your desired thickness. Add the remaining coconut flakes and chocolate chips to the top and gently press them into the mixture. Cover and refrigerate over night. Once they are cold, cut into your desired bar or bite size pieces. Keep these in an air tight container refrigerated for up to 3 weeks. Here’s a little secret…I couldn’t even get through writing about these tasty little nuggets of joyfully packed goodness without enjoying one myself. They’re just too good! Hope you enjoy them as much as I do and please feel free to post your favorite snack or sweet treat recipe for all to enjoy! Spring is here and wedding season has arrived! What a special and beautiful time of year, certainly one of my favorites! Weddings bring out the LOVE in all of us. It’s intoxicating really, with a picturesque setting, delightful flowers, warmhearted smiling friends and family, delicious cake and all that dancing …I’m getting all fuzzy in my heart just thinking about it! On this lovely spring day, I explore the remaining top 5 wedding colors for Spring 2014 along with the complimentary Swarovski color palette. First up, the gorgeous and romantic color of Orchid! This exquisitely rich purple hue is captivating and since being named the Pantone Color of the Year, all shades of purple and fuchsia have exploded in popularity. The complimentary Swarovski colors include all shades of Amethyst as well as Amethyst AB, Amethyst AB-2X, Amethyst Satin and Amethyst Blend. Lilac, Lilac AB and Lilac Champagne are fantastic saturated purple tones similar to Amethyst but a hint lighter. Crystal Lilac Shadow and Violet Satin are elegant sparkling purple effects that compliments the Radiant Orchid palette beautifully. The vibrant berry-like tones found in Fuchsia, Fuchsia AB, Fuchsia AB-2X and Fuchsia Satin flatters these deeper purple hues wonderfully and blends perfectly with this color palette. Lighter luminous purple tones include Light Amethyst, Light Amethyst AB, Light Amethyst AB-2X, Light Amethyst Satin, and Light Amethyst Dorado. The lightest toned purples include Violet, Violet AB, Violet AB-2X, Violet Opal, Violet Opal AB, and Violet Opal AB-2X. Pearls go hand in hand with weddings. Complimentary Swarovski Pearl colors include Blackberry, Deep Purple, Mauve and Lavender. Something old, something new, something borrowed and of course…something BLUE! Blue has and always will be a favorite wedding color. There are a variety of beautiful shades of Swarovski crystal blue tones that compliment the Dusty Blue color palette. The Crystal Blue Shade, Lavender, Light Sapphire, Light Sapphire AB, Light Sapphire AB 2X, Light Sapphire Champagne, and Light Sapphire Satin are all light and graceful blue selections. The Denim Blue and Aquamarine Satin are beautiful more saturated blues that would be delightful for a wedding. A lovely Swarovski Crystal Pearl options is the Light Blue. This soft and charming blue-green color is enchanting yet understated, making this an ideal wedding hue. Similar Swarovski crytsal colors include Erinite, Erinite AB, Indian Sapphire, Indian Sapphire AB, Light Azore Satin, and Aquamarine AB Satin. Powdered Green is a nice soft Swarovski Crystal Pearl option as well. Similar Swarovski Crystal Pale Yellow colors include Crystal Champagne, which is a beautiful effervescent sparkling coating that is soft and elegant. Crystal Lemon is also a gorgeous pale yellow with a hint more color infused as well as Jonquil, Jonquil AB and Jonquil AB 2X are all exquisite. This gorgeous deep and royal blue color is simply divine. Similar Swarovski Crystal colors include Capri Blue, Capri Blue AB, Capri Blue Satin, Caribbean Blue Opal, Caribbean Blue Opal AB, and Sapphire Satin. Tasteful Swarovski Crystal Pearl colors include Petrol, Night Blue, Tahitian and for gem tone colors Lapis and Dark Lapis pair beautifully. What do you think of the wedding color inspirations? I am always happy to help with color descriptions and pairing to create your perfect wedding day jewelry! 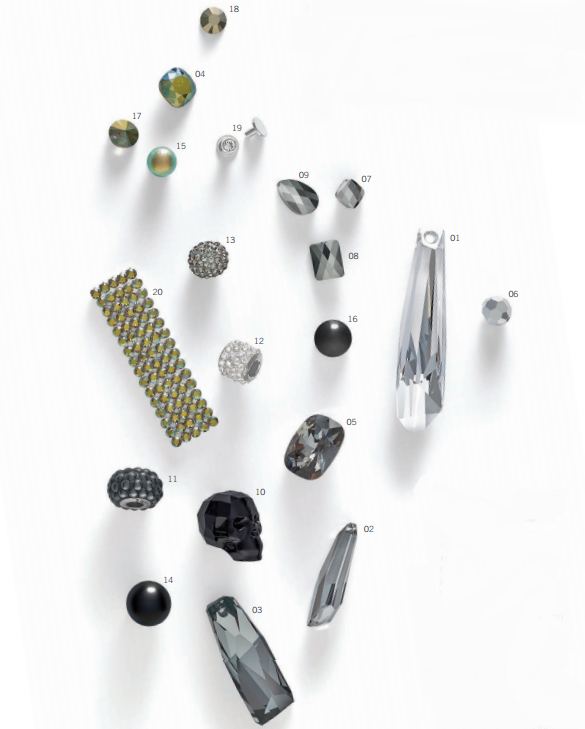 Call me to discuss the vast array of SWAROVSKI ELEMENTS! Spring is here and Looove is in the air! Wedding season is in full bloom and here are the top 10 Wedding Colors for Spring 2014 according to the Perfect Palette. We all experienced the color Mint green explode in popularity recently and this trend continues to grow as a gorgeous spring wedding color for 2014. Mint green, or Mint Alabaster pairs well with warm pink and gold tones such as Peach, Blush, Rose Gold and Glittery Gold and Coral. Complimentary Swarovski colors include Light Peach for Peach, Light Rose or Rosaline for Blush, Crystal Rose Gold for Rose Gold (although be aware that in a bead half of the bead is a solid Rose Gold color and the other half is medium grey color), Crystal Aurum 2X for Glittery Gold, and Padparadscha for Coral. Pearls are the quintessential wedding accessory and Swarovski Crystal Pearls are wonderful for creating beautiful jewelry at a fraction of the cost of real fresh water pearls. Designers and admirers alike are drawn to their consistent color, whole size and perfectly smooth pearlescent coating that gives each bead a perfect polished look. There are a wide variety of colors to design with ranging from the traditional pearl colors to colors that have a soft matte or powdered finish to them, as well as gem tone and neon colors. Complimentary Swarovski Pearl colors include Jade for Mint, Rosaline, Pink Coral, Powdered Rose or Rose Peach for Blush, Rose Gold for Rose Gold, Bright Gold, Gold, Light Gold or Vintage Gold for Glittery Gold and Coral for Coral. Stay tuned for the next post where we explore the additional five wedding colors and the complimentary Swarovski tones. Other cultures continue to inspire us: exploring our Arab neighbors’ opulent and exquisite detailing, we transfer inspiration from decadent interiors and architecture to adorn our bodies. Sensual, seductive Arabian nights; the exotic and the ordinary merge together to create a veiled and hidden design ethic that speaks to the sensual side of the self. An exciting combination of the past and future is shown in luxurious and laboriously made heritage fabrics with exquisite crystal borders and embroidered detailing. A wildness is in the outlook, with glamour being redefined into a free and easy style, increasingly linked to the self. We desire to lose ourselves in spectacular, swaying silhouettes of crystal-adorned cloth to celebrate the simple beauty of being alive, of belonging. 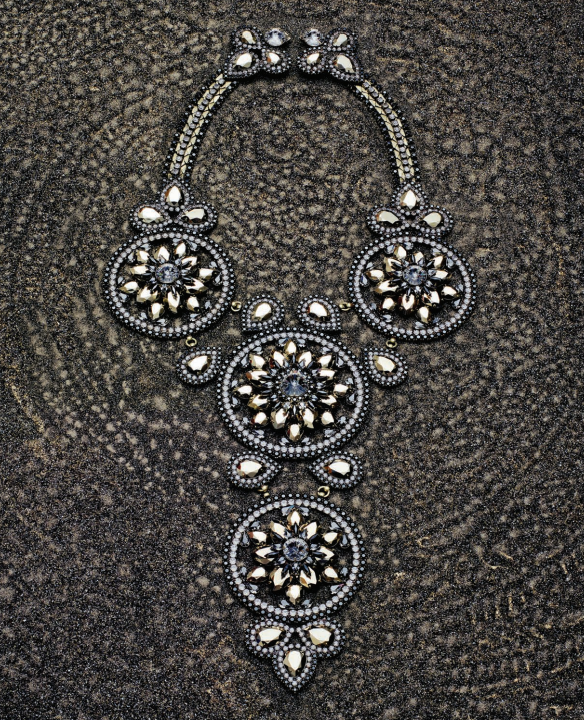 Oriental graphics and architecture inspire the elaborate shape and design of over-the-top jewelry. The circle symbolizes cycles, new beginnings, and continuity – overtaking the triangle shape that stood for growth and stability. The continued rise of the tattoo – denoting belonging to a tribe – has crossed into fashion design with the recreation of intricate patterns on clothing. Accessories have turned to a focus on feet as we envisage the return of the heavily bejeweled sandal or intricate anklets as art forms. 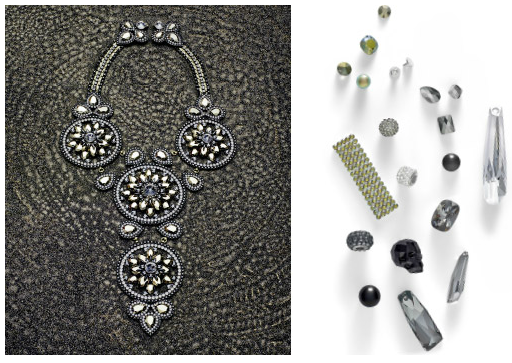 Extravagant Fancy Stones combine with fine crystals to imitate modern oriental patterns. Subtle sparkling elements create opulent design details. The lines between jewelry and accessories continue to become increasingly blurred, particularly in the head-wear segment. Harking back to the glamour and opulence of a mystical past, exquisite craftsmanship and intricate detailing in New Segments speak for a renewed interest in the ancient Orient. Crystal Iridescent Green Pearls add a sophisticated accent to the dark color pallet, while playing with polar opposite directions of Matt and shine. The precise cuts of the mini size beads and larger Pendants create a stunning play between light and shadow. 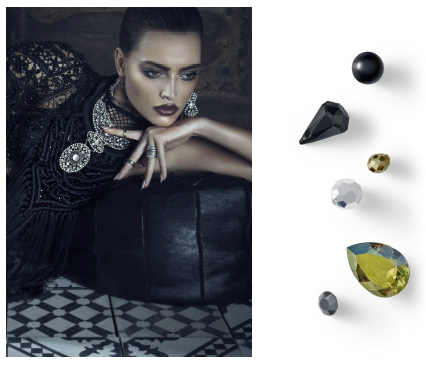 Bold oversize shapes create 3D crystal structures for over-the-top sophistication. 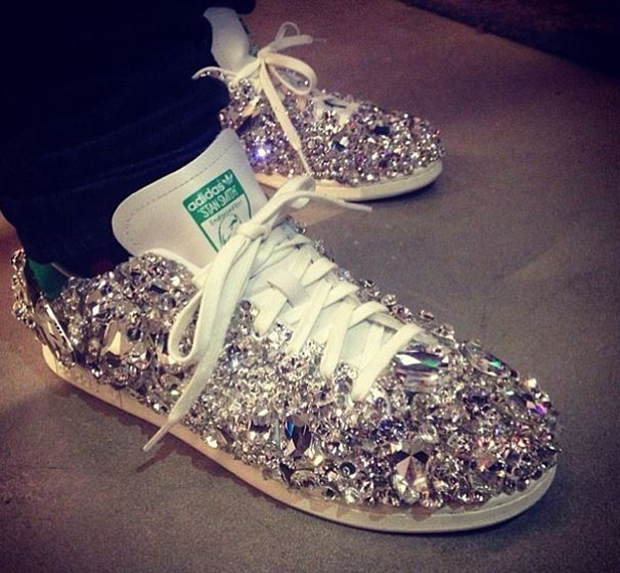 Pharrell Williams Rocks Swarovski Crystal Adidas Shoes! We Stock ’em and Pharrell Rock’s ’em! Rock Star Pharrell Williams Shines from Head to Toe! Pharrell Williams sure knows how to make a style statement with the sparkliest Adidas shoes I’ve ever seen! Pharrell celebrated his 41st Birthday in the most stylish way possible, by rock’n these stunning Swarovski embellished Stan Smith custom Adidas kicks. Pharrell debuted these unique and dazzling shoes during his April 5th “Saturday Night Live” performance and then again on Monday April 7th during his “Good Morning America” performance. These babies shine with over 1600 Swarovski Crystal Flatbacks in a variety of 15 shapes and sizes, which took over 10 hours to apply each crystal by hand. 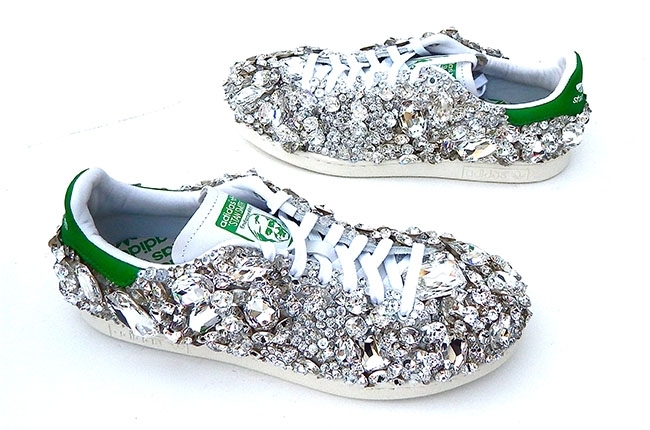 You too can create your one-of-a-kind sparkling sneakers! Choose your favorite Swarovski Flatbacks and glue them on using E6000 glue. It’s that simple! Stay Happy with Sparkles and Smiles! I just finished putting a Swarovski crystal order together that had a huge variety of colors and sizes in the 5601 Cube Beads, which got me thinking…cubes are pretty cool! These elegant Swarovski Cube earrings feature a graduated look using the 5601-8mm in Crystal Golden Shadow and 5601-6mm medium grey toned color. They are beautifully adorned with crystal Squardelles in a gold setting. This beautiful Swarovski Crystal Cube bracelet features a unique wire wrap pattern encompassing the 5601-6mm Cubes in every color of the rainbow. These gorgeous Swarovski earrings highlights the 5600-6mm and 8mm Off-Set Cubes. Jazz up your designs by adding a unique twist to your style using these cool cubes!